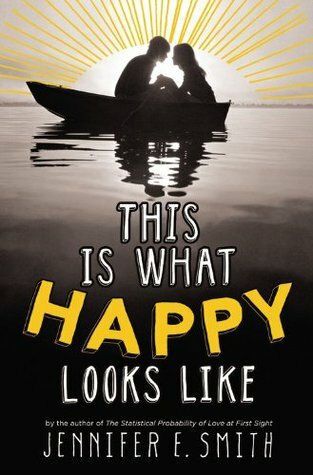 Goodreads Synopsis: If fate sent you an email, would you answer?When teenage movie star Graham Larkin accidentally sends small town girl Ellie O'Neill an email about his pet pig, the two seventeen-year-olds strike up a witty and unforgettable correspondence, discussing everything under the sun, except for their names or backgrounds. Jennifer E. Smith's take "You've Got Mail" and "Sleepless in Seattle" was all kinds of perfect. Ellie O'Niell is living the normal life, with her mom on the beach live in Maine. She has that calm, relaxed life, but not until she accidentally emails movie star, Graham Larkin. In the beginning of the book, I loved reading all the emails they sent each other and it felt real and genuine. And when they meet, Ellie questions if she can have a relationship with Graham and how the spotlight will respond to her. I loved Ellie and Graham right off the bat from the beginning of the book. I felt like Smith's writing was the perfect kind to write this type of book. I like Ellie's quietness and the way she got her thoughts in place, it worked well with Graham's extrovertness (Is this a word??) and his fame. TISWHLL does YA contemporaries justice. The simplicity of the book and the plot can easily sweep you up in the beach of Maine. All of the characters: Graham, Ellie, Olivia, Quinn all created a wonderfully written story that can easily capture anyone's heart. TISWHLL hits everything from reconnecting with a lost person to finding someone to broken friendships to finding one's self. It was perfect! Definitely pick this one up! It would be a great book to pick up this year! Glad you loved this -- it did have a great Maine setting!